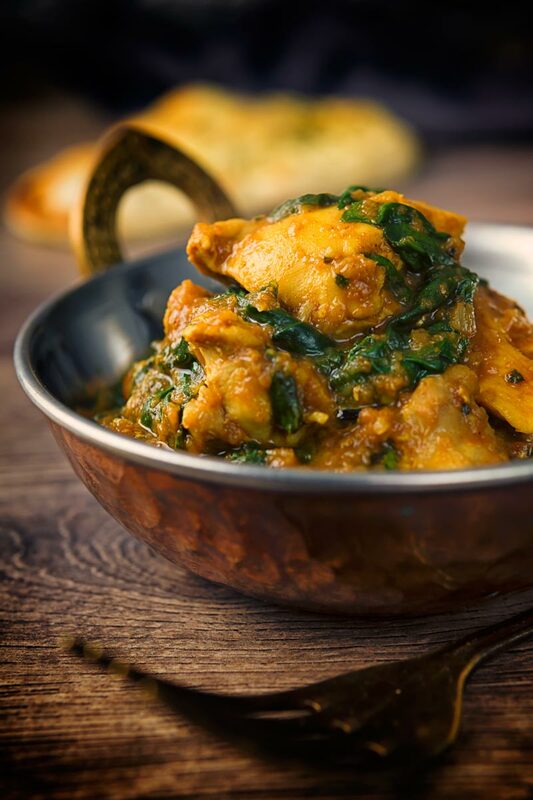 A chicken saag or saagwala is an ever-present dish on the regular British Indian Curry restaurant menu. My recipe is simple and medium spiced and certainly has your daily spinach requirement covered! Chicken Saag or Saagwala Curry. 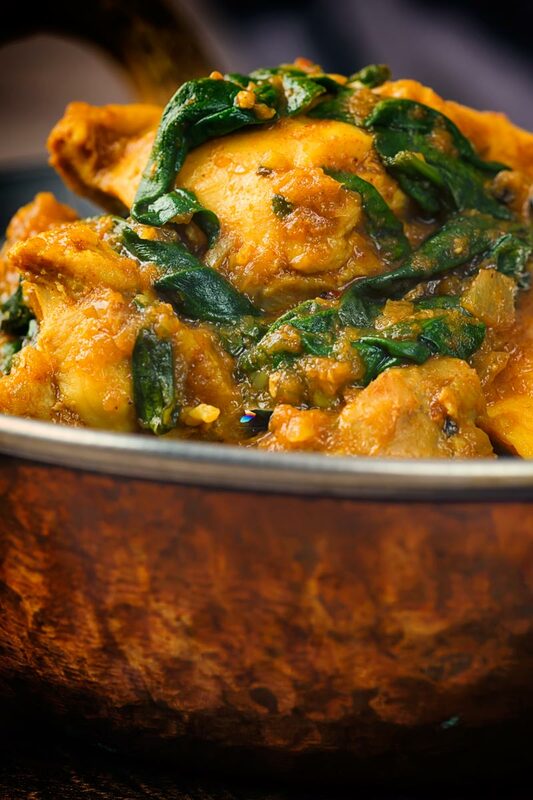 A chicken saagwala is nothing more than a chicken and spinach curry. It is also a fine example of just how much spinach cooks down. When cooking this curry make sure you use a pan that is way too big for a curry for two. If you do not you will inevitably pile in the spinach and then discover your pan is not large enough… Then you will have to swap pans and your wife will moan about washing up! I’m not kidding, initially, the amount of spinach in this recipe looks ridiculous however it cooks down to form a perfectly portioned size dish. How Spicy is Chicken Saag? Like all curry recipes, how spicy they are depends on you, the cook. You can adjust the spice levels to your own taste. Having said that a restaurant chicken saag falls firmly in the ‘medium’ curry range of the spectrum. It would probably fall between a Chicken Jalfrezi or Chicken Pathia on the hotter side and a Chicken Pasanda on the milder side. All of the heat in this recipe comes from Kashmiri chili powder. It also uses far fewer spices than many of my curry recipes. 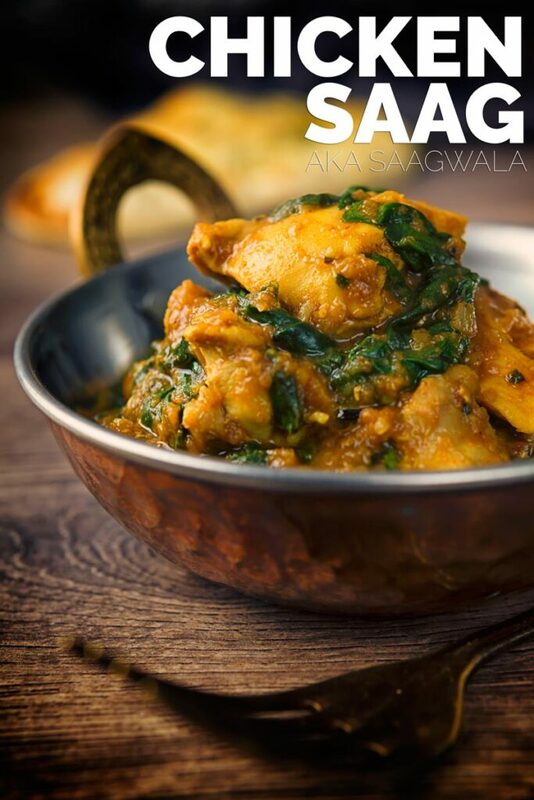 What is the Difference Between a Chicken Saag and Chicken Saagwala? Quite simply the answer to this question is nothing. They are the same names for the same curry, although as with all recipes there are subtle differences between cooks. This dish is often also called Chicken Palak. Palak definitely means spinach in Hindi whereas Saag translates to ‘leaf greens’ in Hindi. For instance, my saag aloo recipe uses Swiss Chard as the leafy element. 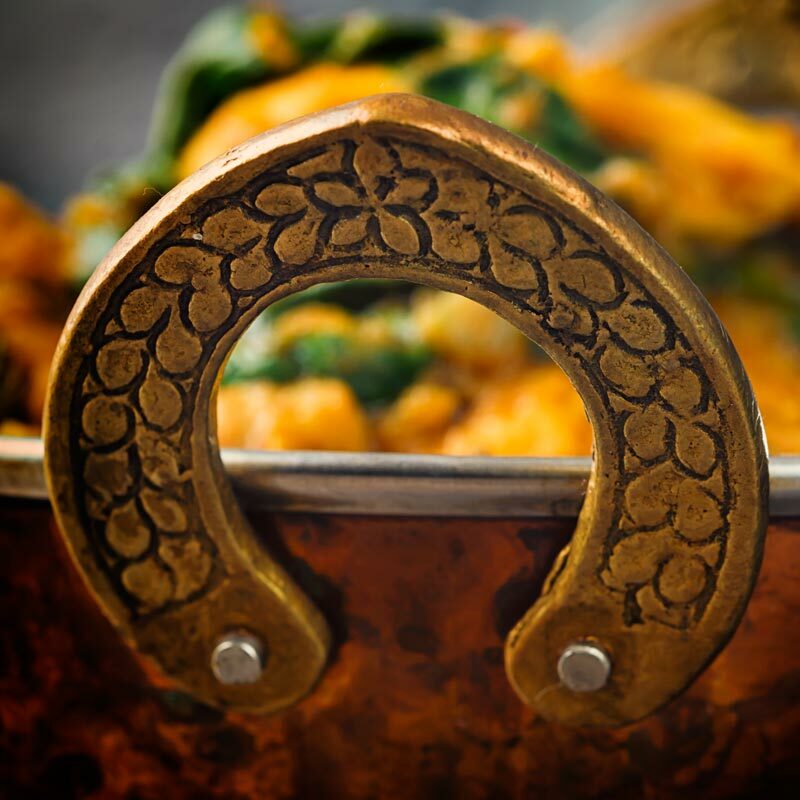 In this way, it is perfectly possible to subtly change the flavour of your saagwala by changing the leafy green element. This recipe contains a couple of unusual additions at the end of the cooking process. I urge you not to skip or add these ingredients earlier in the process. Adding the ghee and the ginger for the final 5 minutes completely changes but the texture and the flavour of this recipe. Adding the ginger at the end adds a wonderful and vibrant flavour to what is a very ‘earthy’ curry. The ghee lends a richness to a recipe that could otherwise be a little ‘light’. This is a relatively new idea I picked up from floating around a Pakistani cooking forum. Yes folks, that’s the sort of place that I hang out online, liing large hey? 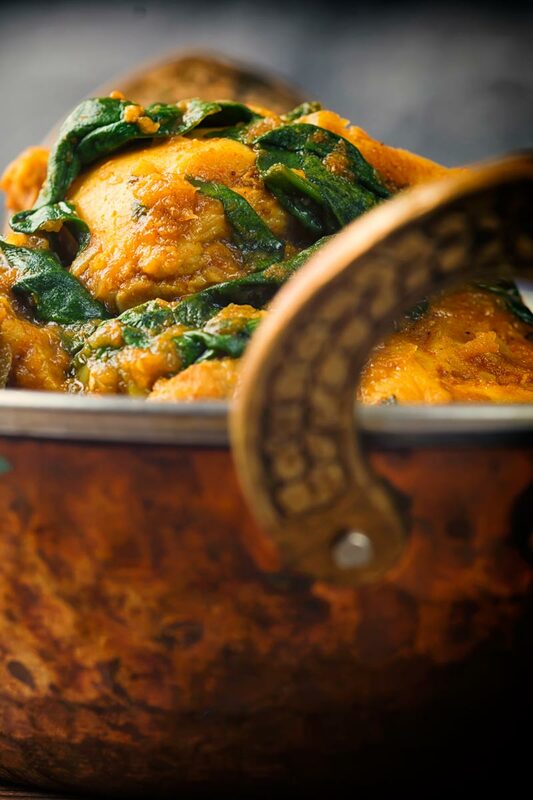 A chicken saag or saagwala is a popular dish on the British Indian Curry restaurant menu, simple and medium spiced this has your spinach requirement covered! Blend the onion and garlic with just enough water to form a paste. Add this onion to a pan over a high heat with half of the ghee and cook off the water, this should take 5-10 minutes. Now reduce the heat to medium and cook for 10 minutes until golden brown. Add in the spices and stir for 60 seconds. Chuck in the tomato passata, season well with salt and 250ml of water and cook for 5 minutes over a medium heat. Use this time to dice the chicken into bite sized pieces and roughly chop the spinach. Add the spinach and chicken to to the pan, don't worry if it looks like a lot of spinach, it will cook down. Add a lid and cook for 25 minutes over a medium heat. After 25 minutes remove the lid and add the remaining ghee and ginger stir and cook for 5 more minutes. Serve with naan bread and maybe a little rice if you are feeling greedy! Am I reading the recipe correctly? The onion/garlic is dry fried? No oil? And the grated ginger is added last and not cooked through? This is such a gorgeous dish! And I love all of the spices you have used in here! Can’t wait to try it! Hi Brian. Your recipes look amazing! I’m looking forward to trying them out on my family. 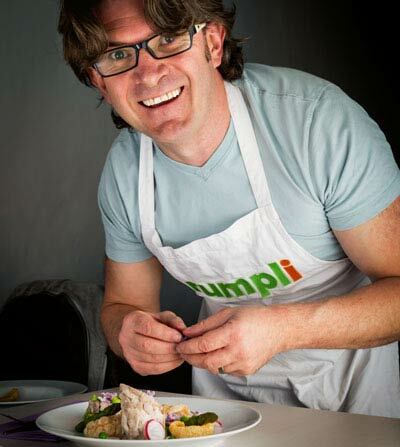 I was wondering if you had an email subscribers list that I could sign up to get your recipes sent to me regularly? I love chicken saag! It’s a dish I often make at home but I have to go easy on the spinach these days otherwise my kids avoid all of the sauce! This dish so takes me back to many a British curry restaurant, as I’m sure it does for you. Looks wonderful – like the tip about adding ghee and ginger at the end, I must try that. Thanks Caroline… Adding the ghee at the end is very much similar to classic European cooking, enriching sauces with butter but the ginger thing blew my mind. It adds a wonderful warm ginger heat and top note to the recipe which I loved! 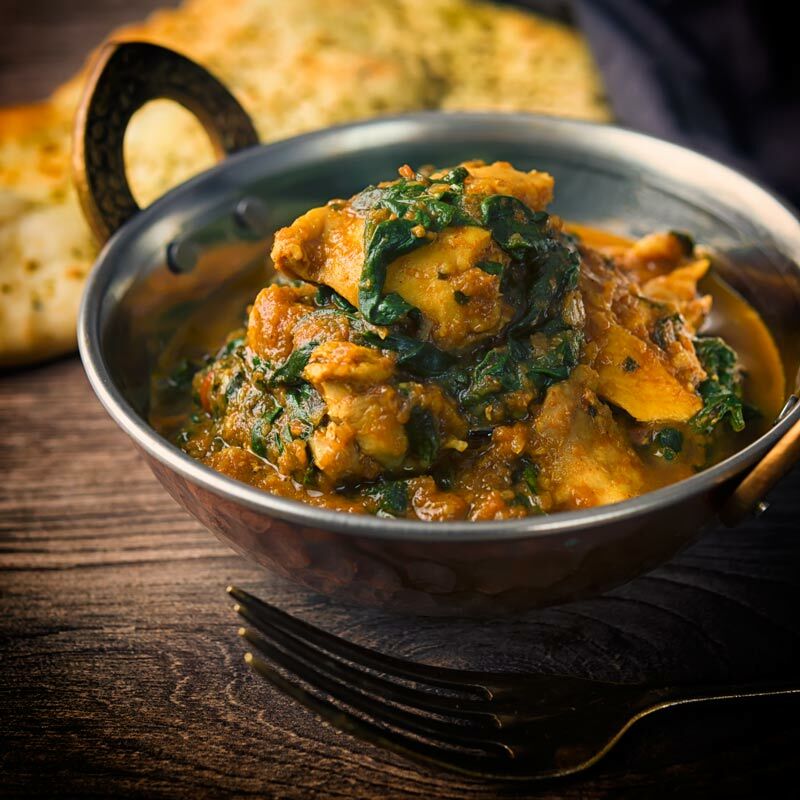 Absolutely delicious, would love some chicken saag for my lunch with one of your delicious naans, apart from armchoor which I never heard of I love all the ingredients in this recipe, going to shop for chicken and spinach this afternoon!